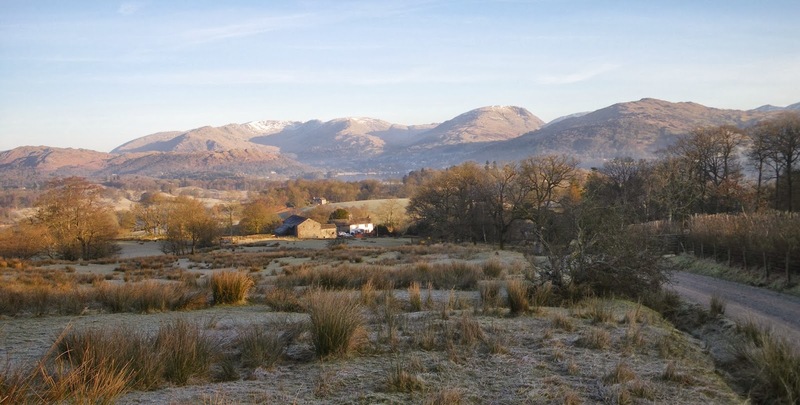 At High Wray Basecamp volunteer centre it’s often the trip up our track that is the first thing visitors comment on, with it’s fantastic view towards Ambleside and the Fairfield Horseshoe. ‘I could look at it all year’ has been said by a number of people, which got us thinking – could we show the view from the track for a whole year? So in 2013 every time we came up it in the morning we took a photo. Here they all are, fast forwarded to scrunch a year down to a minute or so. It wiggles about a bit as the camera’s ‘tripod’ was an old fence post with a home made frame (seen briefly at the start), which we had to slot it into each day. As well as this cows gradually pushed the original post over until it needed a replacement and there’s also a big gap in the middle due to holidays (Summer wasn't that short, honestly). Despite all this we think it gives an interesting perspective on the seasons changing and we think you can really understand why the view does attract so many comments. But it’s not just visitors to Basecamp that can marvel in vistas like this – the Lake District is full of them and looking at this every day makes us feel very fortunate to be playing a part in helping to look after it. It’s the most inspiring start to a day you could wish for! You may remember last year we introduced to you some new interns in the form of Leila, Kim and Stuart. 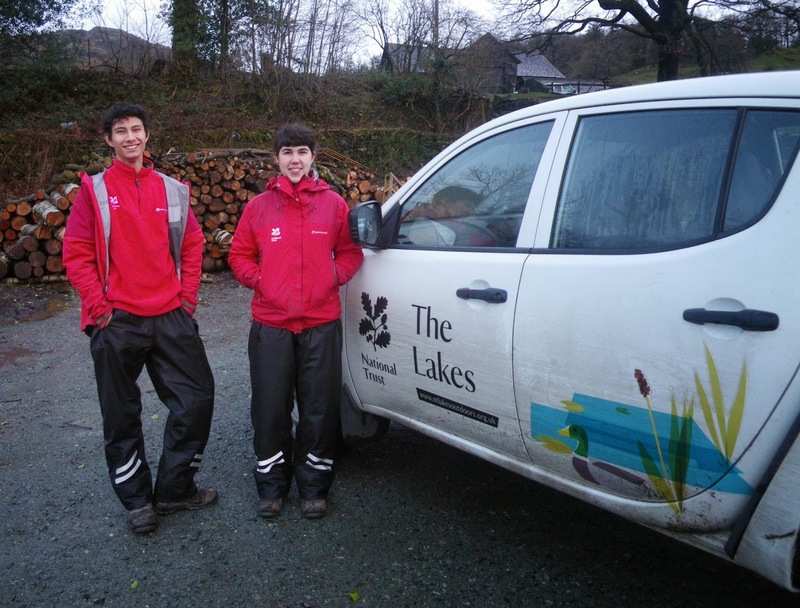 They did some great work across the South Lakes working with the Coniston, Hawkshead, Woodland and Upland team over an 8 month period. With their internship ending just before Christmas we recruited two new interns in the form of Jasmin and Paul. They've been with us just over two weeks now and have been thrown into a few different projects including fencing, walling and some drain building at Wray Castle. Getting stuck in with some walling! Over the next 8 months they'll have the opportunity to learn lots of different skills and learn about the way we manage our property in the South Lakes, from all angles. We're also pretty sure that they'll get to learn the importance of never being separated from your lunch (a key ranger rule), the value of cake (especially when working with the Upland team) and the best way to dry boots so they're not quite as cold and horrible to put on the next day! Hopefully they will enjoy their time in the South Lakes as much as Kim did and gain lots of useful experience along the way. With a new year comes a new project for the Upland Rangers, and a interesting and challenging one at that! With our team expertise in stone work, come the winter months it's an opportunity to tick off various stone work tasks around the property, such as the work at Moss Eccles . This time however we were off to improve one of the access routes into one of our local quarries. A beautiful place to work, but rather a lot of different challenges to contend with! First off we needed to get stone onto site. Working in a quarry there was plenty to choose from, but getting it to the path was a mission in itself, especially as there was rather a lot of steep ground to contend with and rocks have a tendency to roll! Step two- roll carefully down onto path! While we were doing this part of the job, we did close part of the quarry off to minimize risk to the public and it would appear that a local resident also took advantage, deciding to try out some of the more extreme pastures available in the Lakes! With two of the team were getting stone onto site, the other two were sorting out some of the drainage that had washed the old path out in the first place. Diverting water away from the path is always a key task as, more often than not, it's not people erosion that's the biggest problem, but in fact water. Which with the amount of rain we get in the Lakes makes drainage quite a priority! With the recent wet weather, water is something we've most definitely seen plenty of. At one point Sarah even appeared to be making a swimming pool rather than a path, the splash however when a stone was dropped in was particularly impressive! Having been working on the path for a couple of weeks now it's looking much better than it did before and it won't be long before we've finished. It will also hopefully be much easier for the numerous outdoor groups that use the quarry. So if you're in the area and you see us beavering away feel free to come over and have a chat, but one small request, please don't cook bacon in the immediate vacinty, it affects our productivity!